After announcing the Ripsaw HD capture card, Razer has officially launched its new Core X Chroma GPU case for Windows laptops and MacBooks. It comes with an integrated 700 W power supply and RGB LED colored lights. In connectivity, the accessory has four USB 3.0 ports, a Thunderbolt 3 and a Gigabit Ethernet, plus a USB-C to recharge laptops when it’s plugged in. The video outputs consist of three DisplayPort and one HDMI ports. The new gamer brand comes with compatibility with NVIDIA and AMD graphics cards – in the latter case, there is a need for XConnect to be used externally. The installation is done through a drawer, with access to the connector without having to open the Core X Chroma. The case requires Thunderbolt 3 connection for both Windows 10 and MacBook notebooks. The first ones should still be in the latest update – Windows RS5 – while the latter has to be with Sierra High 10.13.4 or later installed. “Designed to work with a wide array of Thunderbolt 3 Windows laptops and MacBooks, the Razer Core eGPU line will give mobile warriors the ability to tap into the massive graphics processing power of a desktop gaming machine with minimal hassle. This allows users to play the most demanding games and create world-class content at blazing speeds,” the company reports in the press release. 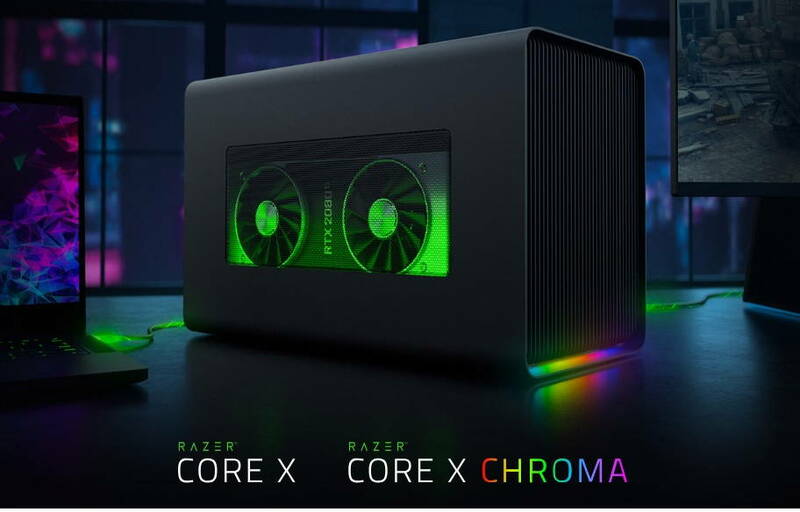 The Razer Core X Chroma can already be found in the international market. It will be available in the United States, Canada, UK, France, Germany, and the Nordic countries at a price tag of USD $399.99. It will be available soon in China, Australia, Hong Kong, Japan, Singapore, South Korea, and Taiwan.